We spoke to Peter Kato, creator of the Turtle Tetsujin, figure about his journey in the toy scene to where he is today – a very interesting read from a hard-working artist. Enjoy! It sounds like you’ve been in and around the toy scene for awhile… from working at Toy Tokyo to now designing toys… how did this love affair with toys start? And how did it progress to where you are now? I guess it starts like most in this toy community we have, as a child playing with toys. All my life I’ve appreciated toys from the first Kenner Star Wars figures, GI Joe, He-Man to the more current Bearbricks & kaiju vinyls of today. I love ’em, old & new. To how it progressed to my present involvement as what I consider myself an indie toy maker, took a long time to get to I guess. Back in the mid-1990’s I had my first experience in the comic book/toy convention scene as an indie comic book illustrator with this amazing group known at the time as Team Smile Inc. We were together for over five years selling our indie comics/indie music all around the U.S & Canada in hopes to gain a fan following big enough to gain attention to some hollywood type investors that would help us create a brand where we would then create apparel and merchandise, which included toys. We got “real” close towards the end, but like many big-dream adventures it was not meant to be and our group was disbanded. Following this I found myself working at Toy Tokyo from its earliest years. I learned a lot in this wonderful place. As the years passed ( 7 years to be exact) I participated in the toy community, helping organize those first early custom shows and occasionally getting into them myself. I saw many opportunities come for artists at the beginning of this art-toy “boom(? )” I wanted to get my toy idea made! I thought this was the only way for someone to make my toy, by discovering me as an illustrator. But many years later that never happened. I found myself never being discovered and quietly just participated in the toy community as a fan and organizer of toy related events. I was really good at that part, being the “people person “. It’s really nice when people even now appreciated my time as a Toy Tokyo manager, but the artist in me was slowly turning into a bench-warmer, and eventually did. It was in my last year working there where I got the opportunity to meet Dave Cortes (professional artist, sculptor & head of Cortes Studios). He was heading his first studio back then in Redhook called Inu Art; they had been in the industry as professional sculptors for hire for over a decade. Many of the artists there were customers of Toy Tokyo and would visit frequently. They invited me to come visit the studio many times but it wasn’t until they told me that officially Dave wanted to meet with me when I actually went. I found out that they wanted my input into the current toy scene. They were beginning to venture into creating their own self inspired, self produced toys & wanted to know what I considered popular and current (good sellers). So on a non-official level I became a type of toy-nerd consultant. For a time that’s how our relationship started. What I saw when I was there seemed like magic to me: sculpting, casting all of it seemed like something that I could never get to do. I was proven wrong. Dave said, “If you like to draw, you can learn to sculpt .” He and the artists working under him literally broke down the physics of sculpting by hand, making silicone molds, resin casting for me. With generous guidance I was allowed into a world I forever thought was out of my reach – making your own toys. I spent a summer there being a sort of “head of the interns” that were recruited from art schools. I would “learn” with the interns while keeping an eye on their schedules and such. I didn’t get to make anything until a year later which was for the Toy Tokyo 9th year anniversary party, where I made a very crude mini figure called Dr Nanogon. And I didn’t get to make my next figure until a year from then for Toy Tokyo’s 10th year anniversary event where I made 110 pieces of a figure called Gaganga, to be given to the guests at the private event in the goodie bag. As I was learning how to hand sculpt and produce resin figurines, there was a huge shift into the professional sculpting world. Things were going into a digital 3D sculpting age. The results of this directly affected my path from this point on. Because hand sculptures were becoming less in demand (because a digital sculpture could not only produce a variety of sculpts in a variety of styles but take that same sculpt and produce a digital print in any size possible). Literally the options and possibilities go beyond that and more. So to keep up with this change in the industry, Dave took two years and learned by himself the skills in digital sculpting (he’s a teacher at SVA now; he’s quite a genius, he is my Yoda). He decided to reorganize his art studio – new location – new members. I was invited to share this new studio space. It’s called the Cortes Studio. 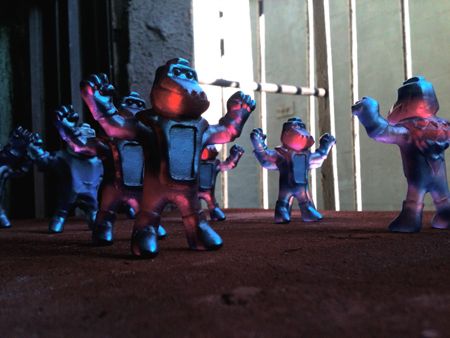 And there I continued to learn what I do now, making resin toys as an indie. Can you tell us more about the Turtle Tetsujin figures and specifically your Japan Charity edition? The Turtle Tetsujin is my Japanese Giant Robot inspired super-bot with a heart. He’s become one of my most popular of my original figures. My “Hinomaru Japan Charity editions” were my follow up charity project “pocketpowers” (last year’s Toy Tokyo collaborative charity project). Both projects were my efforts to try and help raise money and awareness for the victims of the Earthquake/Tsunami disaster that devastated the people of Japan in 2011. My plan is to every year try to raise funds for the charity with a new figure. For this year’s Hinomaru Turtle Tetsujins, I approached myplasticheart to help. They did an amazing job getting the word out and sold many of the figures. The design of these figures for me is possibly my favorite, they were the most difficult to produce correctly. Getting a solid resin piece to float in a crystal clear figure in the relatively same spot was super hard. I have a whole batch of ones that didn’t make the grade at all. But I’m happy that they all went for an important cause. Tell us more about Cortes Studio and your involvement there. Cortes Studio is a currently a multi-development studio specializing in rapid prototyping manufacturing. It’s not just toys. My involvement here is actually more as an independent artist that shares the studio-space and is occasionally brought on as a contributing concepts organizer for the studios personal art projects (similar to my role back in Inu Art). My schedule is actually different from everyone’s because my day job is at another art studio as a design & production assistant. I come here after work (everyday) as the main staff is leaving for the day and spend what hours I can on my craft. Dave is usually the only one who is there even after the day-shift, so we get go over ideas and concepts for the future while working on our own stuff. Any projects you can hint at that will be coming up? I’m currently (while producing and selling my toys) learning the beginnings of digital sculpting; once I have a naive handle on this I look forward to what options or opportunities that skill will open for me. I’m working on a piece for a group show in LA (which I can’t advertise yet) and creating new figures that won’t see the light of day till… well, New York Comicon? What toys act as inspiration to your work? I guess it’s the toys that you see on my work desk. In particular lately I have been really studying the figures of Uamou (Ayako Takagi) and the cyclopian Fortune Cat (RealxHead). I’ve recently began to appreciate these figures in a new way. I feel it is really hard to make a successful figure that is more “simple” in design. I’ve read and have been told by artist veterans that a strong silhouette is the hallmark of great design, because the eye perceives the shape first before all other details. Many toys try to follow this goal but I feel only a few succeed. If I were to critique my own work versus this idea, I have a long time before I can come up with anything as strong as Uamou or Fortune Cat. But I’m trying everyday, with luck and inspiration, it might come to me. Thanks so much to Peter for opening up to us about his work in the toy world! We look forward to seeing his work continue to develop as he strives for creating more beautifully designed work. Tomorrow check out a look into Peter’s studio here on the blog.